Moksha has been relocated from Antwerp to Oostende ready for the prep work to be started for The Channel crossing. The weather is good until tomorrow evening (Sunday) but rain is forecast Monday through Wednesday, so tomorrow the repaint and other tasks begin in earnest. She's been sitting in the driveway of a house belonging to Robin and Kathleen who have kindly provided free storage since she was shipped from Djibouti. I'm always a little apprehensive the first time I see her after she's been handled by other people, in case of damage during transit. But she looks in pretty good nick - in about the same shape as when we left her in Djibouti almost 6-months ago: getting a little frayed and dog-eared around the edges but otherwise structurally sound. The only part of her that will be repainted is the hull where almost 2,000 names of expedition supporters will be replaced sometime the middle of next week - IF the printers from Mumbai deliver them on time! 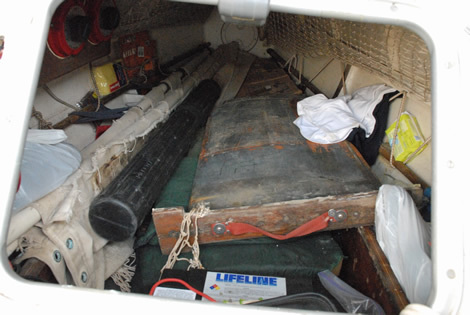 Sleeping compartment filled with gear, also a large African spider that I caught a glimpse of briefly! Things are definitely beginning to pick up momentum now we're into the final two weeks before completion. Today I rode the last 100kms from Nathalie's basecamp in Denderleeuw to her brother Gille's apartment in Bredene, just 4kms from Oostende (which I'll complete tomorrow morning). This will mark the completion of the 3,178km overland section through Europe by bicycle, and the staging point for the final crossing of The Channel, currently planned for next weekend. Weather is everything for this final wet bit, especially now we're getting into typical autumn weather patterns with low pressure systems sweeping westwards across from the Atlantic every week or so. The ideal time to cross to the Kent coast will be when the tide is coming up to neaps (not as strong as springs), the wind is as light as possible (certainly no more than force 4-5) and from the southwest. 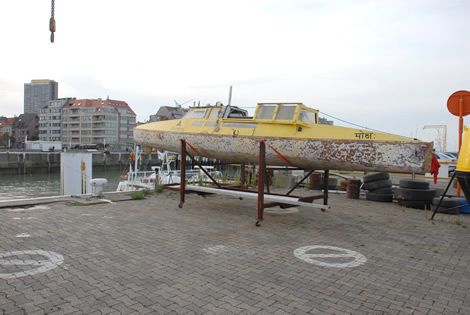 The likely scenario for the next week is that we'll work on Moksha here in Oostende at the Royal North Sea Yacht Club (who are kindly providing complimentary space on the quayside for the prep work) for the next 5-6 days. The Daily Mail (UK) come in on Tuesday for a preliminary interview and photo shoot for a 2-page spread next weekend. Chris Tipper (Moksha's builder) and Kenny Brown (film maker) arrive mid week for helping with replacing some of the polycarbonate windows on the boat and documenting the final event respectively. Eilbhe Donovan arrives Thursday to add a beautiful new figurehead design to Moksha's bow for the completion. And other expedition team members from previous legs start filtering in from next weekend onwards to assist with last minute preparations and to have one last pedal in Moksha before she's hauled out of the water for retirement post completion. Depending on the all important weather window Moksha will be relocated again towards the end of next week either to Dunkirk, Calais or even Boulogne. The stronger the wind from the west or southwest for the crossing, the further west she needs to be launched to compensate for the effect of windage. The last thing I need is to miss the English coast and end up in Denmark! Meanwhile the UK support team, headed up by Lee Reynolds, a professional event organizer with Southampton University, is ramping things up the other side of the Channel. The myriad of small details these guys are currently dealing with, from securing keys to gates in Greenwich Park to liaising with The Duke of Gloucester's security team, is truly amazing. I am truly blessed to have all these people on board pulling out the stops at this critical time. And a special thanks also goes out to the Lauwerier family for being such gracious hosts here in Belgium. 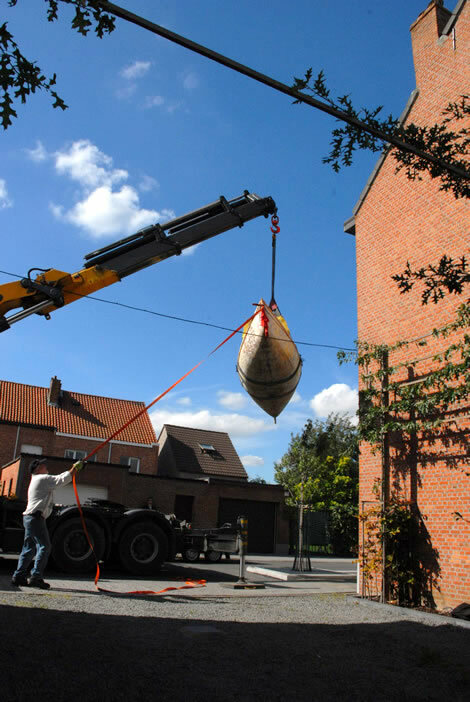 The crane hire and transporting Moksha from Antwerp to Oostende ended up costing a whopping $850 USD! Once again I have seriously underestimated European prices, with the result that a rather large dent has been put in the remaining budget for the expedition completion. I know many of you have already contributed generously to getting Moksha back from Djbouti, but if there are any of you that missed out on the funding drive the first time around, a contribution towards this cost would be greatly appreciated.